The Lord welcomed Jody Woods into his kingdom Sunday, Dec. 31, 2006, after a brief yet courageous battle with cancer. Mrs. Woods was 72. She was born JoAnna Jewel Selle on July 24, 1934, to Mance and Anna Selle. She was a lifelong resident of Picher. Jody married Mr. Dennis Gene Woods on July 21, 1956. They shared 43 wonderful years of marriage. Mr. Woods preceded her in death on Oct. 27, 1999. Jody was the proud mother of three sons whom survive: Mr. Dennis Gene Woods Jr. and wife Myra of Ruskin, Fla., Mr. Steven Edmond Woods and wife Nancy of Tuscaloosa, Ala., and Mr. Mark Logan Woods and wife Judy of Dallas, Texas. Jody adored her role as grandmother of 13 grandchildren and great-grandmother to six great-grandchildren. Jody adorned her home with photos of her family and loved to share both photos and stories with all that came to visit. Jody is survived by three siblings whom she shared a close relationship with and whom she loved and cherished immensely: Mrs. Eleanor Peace of Baxter Springs, Kan.; Mr. Harvey E. Selle of Picher and Mr. Robert L. Selle of Springfield, Mo. Mrs. Woods is survived by a host of nieces and nephews that she loved dearly. 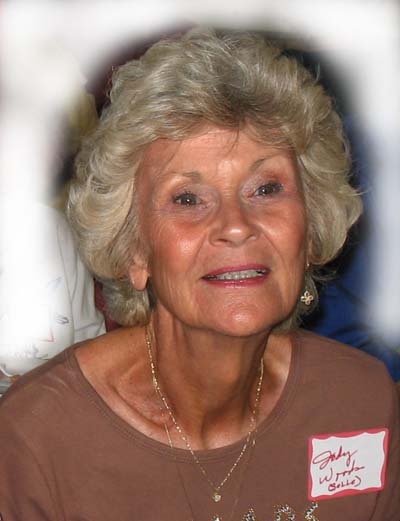 Although Jody was formerly employed as a secretary at the B.F. Goodrich Corporation in Miami for 10 years, her greatest job and achievement was that of wife to Dennis and mother and grandmother to her children. Mrs. Woods was a member of the Nazarene Church of Picher. She shared a host of friends in the Nazarene Church and shared many years of fellowship and memories as a member of the congregation. Jody and Leroy Martin of Picher shared a special friendship as did their respective families. Each helped the other to smile again after the loss of their spouses. He survives.